I’ve posted about this before BUT it’s worth posting again. If you’re feeling a little blue about the plants and flowers in StL going dormant as well as the cold weather that’s about to settle in, I invite you to bundle up, grab a cup of coffee/tea and a camera, and venture outdoors. There is a somewhat rare occurrence that only happens when temps are above freezing, ground is thawed, then temps suddenly dip down below freezing. 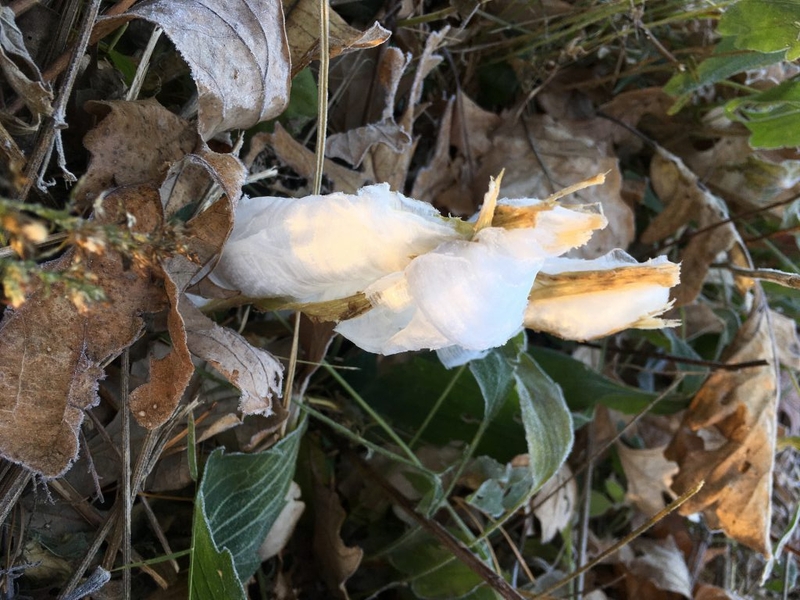 This occurrence is called frost flower and is produced here by only a handful of plants native to Missouri (though there are other places around the world where this can happen). 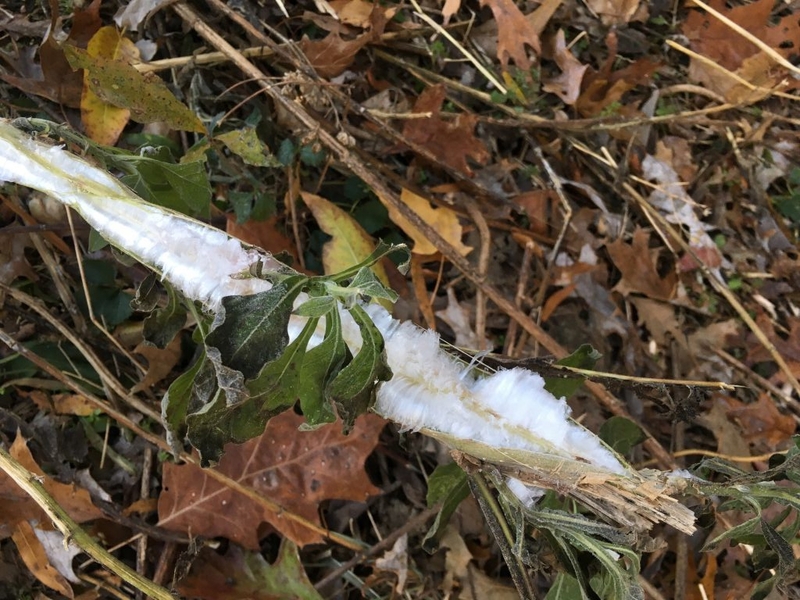 As the ground freezes, the moisture still present in the stems of these selective plants will also freeze, and since water expands as it freezes, so does the moisture held in these stems. 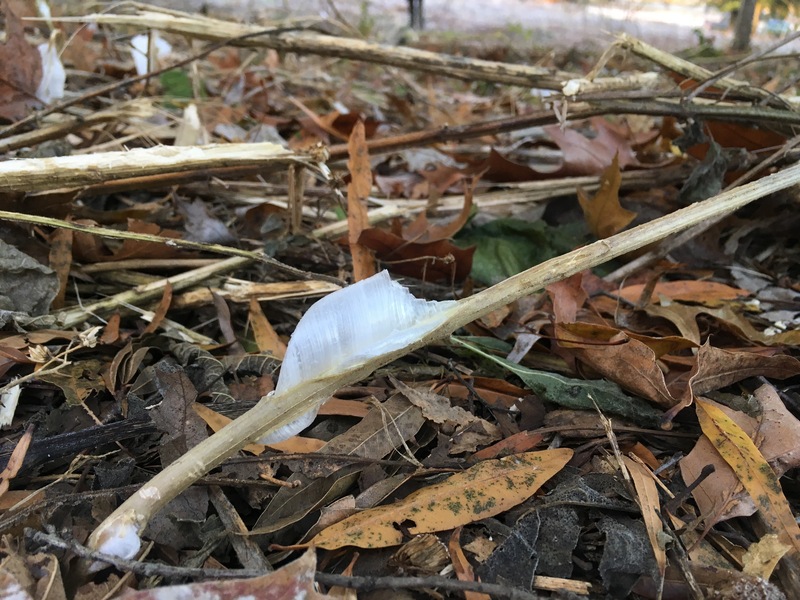 The stems become fissured from ice bursting out of the stem and these delicate ice ribbons, or “frost flowers”, are formed. 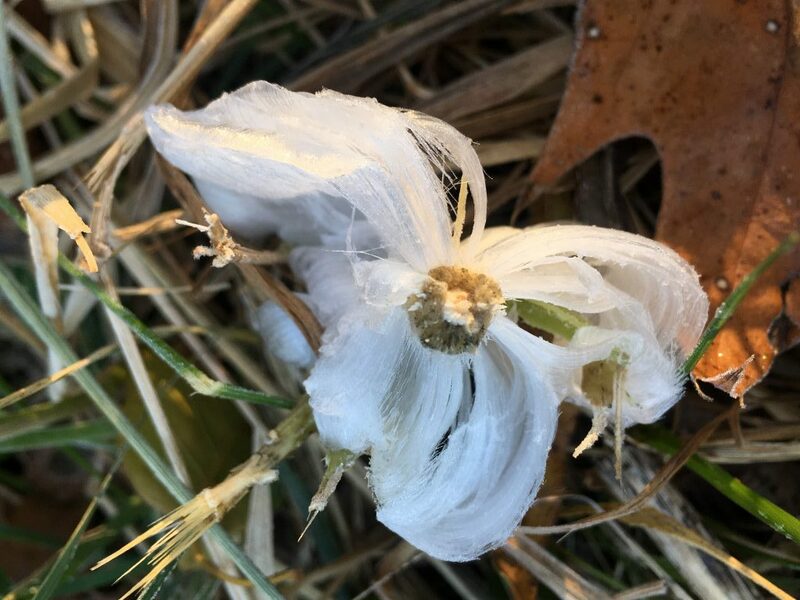 The best time to see frost flower is early in the morning before the sun hits the frost flowers and melts them giving a relatively small window of opportunity to view it. Up to around 8am seems to be a safe window but this can vary especially in areas more or less shaded from the sun. Also, weather patterns and temperatures matter big. Look for a day where the temperature is up above freezing then dipping well down below freezing at night. 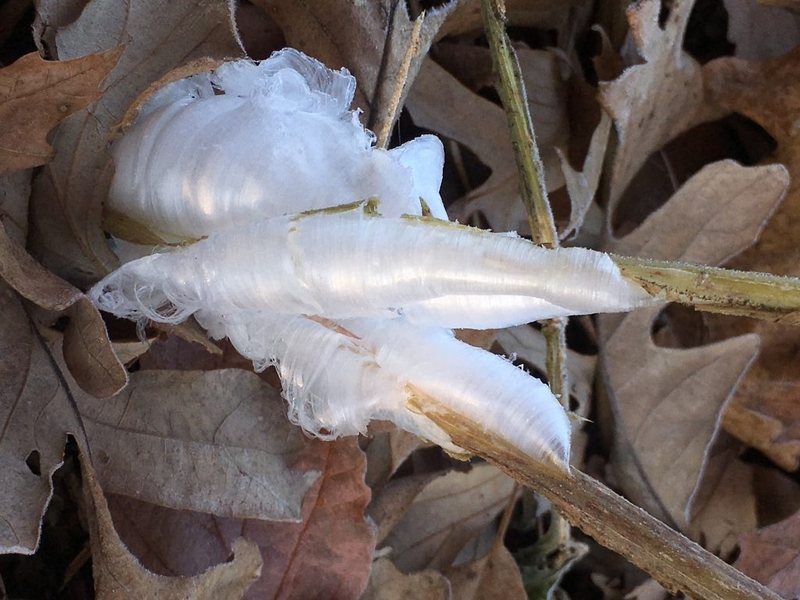 The next morning should be an ideal time to see frost flower (like later this week!). There are limited places to see this phenomenon since particular plants have to be present, but the Healing Garden up the hill from the parking lot at Steinberg Ice Skating Rink (though it has been mowed down) is a stellar place to see it. 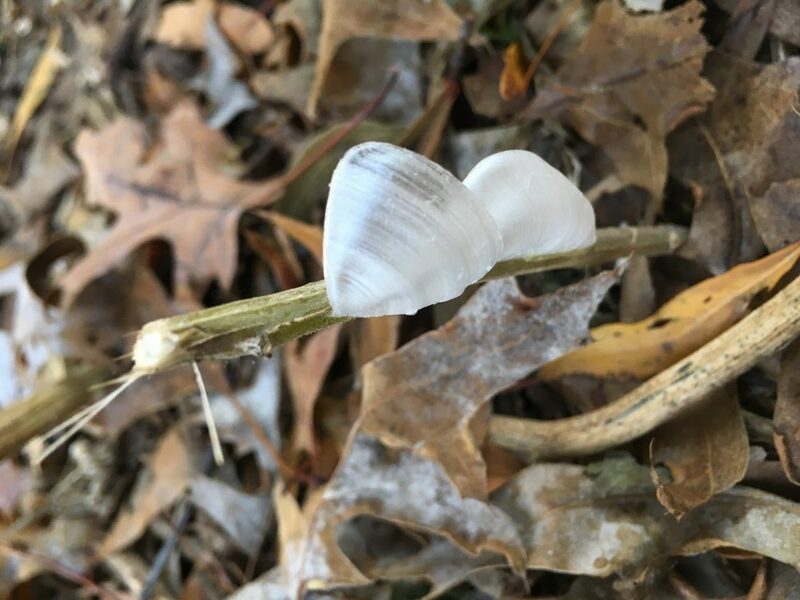 We saw frost flower multiple times throughout last fall and winter in this location since the weather kept warming up and cooling down. It is not always a one-time-only sort of deal, but can be hit-or-miss. There are 2 species of plants, scattered about in this garden, which are known to produce frost flower: White Crownsbeard (Verbesina virginica) & Yellow Ironweed (Verbesina alternifolia). No need to identify which cut down plants in the garden resemble these species. You will see the frost flower as you approach. From a distance, the frost flowers may look like bits of white tissue paper or white ribbons, scattered in groupings around the garden. But, closer inspection of the garden floor will reveal the graceful ice ribbons that are frost flower.